Fast-growing business case e-store GotBriefCases.com is now showcasing the Solo brand of executive luggage—just in time for the busy holiday buying season. Formerly known as US Luggage, Solo has been in business for nearly 100 years. The company introduced its laptop briefcases, computer bags and messenger bags to the world in 1972. Solo’s recent innovations include the Smart Strap™ retractable shoulder strap and the Ride Along™ Pocket, a convenience breakthrough that enables you to quickly, securely attach your SOLO bag to any rolling case. Their laptop bags, briefcases, pilot bags and catalog cases are proving to be extremely popular in the market. A particular hit on GotBriefCases.com is the Solo Rolling Laptop Briefcase and computer bag. Made of classic Colombian leather the briefcase’s main compartment contains a removable padded CheckFast™ sleeve which holds a 15.6 inch laptop. Tovmasyan launched Los Angeles-based GotBriefCases.com from scratch in 2009 at a time when he had no prior experience in ecommerce and didn’t even speak English. A friend gave him the idea and helped create the website. Tovmasyan rolled up his sleeves, learned English and began contacting manufacturers. Today, the online retailer carries more than 50 brands and over 5,000 products in a multitude of different colors. Brands include household names such as Samsonite, Hartmann Luggage, Zero Halliburton’s business collections, TravelPro Luggage, Kenneth Cole bags and Jack Georges. GotBriefCases.com appeals to a wide audience including professionals such as attorneys, CPAs, businessmen and women, and teachers, as well as travelers and students. What differentiates Got Briefcases from other luggage websites? 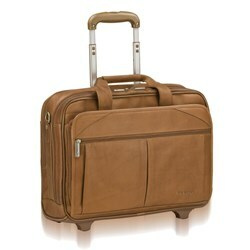 About company: GotBriefcases.com is an up and coming online provider of fine luggage and business cases. GotBriefcases.com is the destination for briefcase or luggage. When it comes to finding the right case, GotBriefcases.com has it in the bag. To find out more about the Solo line and Got Briefcases’ wide array of products including leather briefcases, laptop cases, computer bags, and backpacks, visit their website at http://www.gotbriefcases.com.